Comes in an off-white or striped cover with zipper. 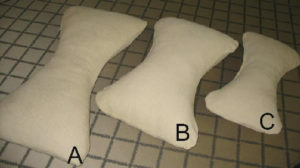 All natural Latex Pillows conform to the shape of your head and provide continuous support throughout the night. 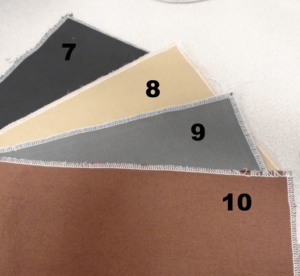 The holes in the latex provide maximum air flow, preventing moisture and heat buildup throughout. 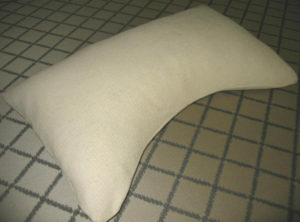 These wonderful pillows never require fluffing, they maintain their shape and support for years. Add $ 10.00 for cover with zipper. Click here for cover options. give you support for you head. The holes provide maximum air flow, preventing moisture and heat buildup throughout. When on your back, it supports the natural curvature of your neck while its slight concavity accommodates the shoulders. When on your side and angled properly, the support follows the line of the chin, ensuring support of both head and neck. Add $ 14.00 for cover with zipper. Click here for cover options. Neck support pillows are shaped like an hour glass. They are designed to fit comfortably around your neck. These pillows are designed to allow your head to rest while sitting or laying down. Also can be use to support your hips.